The story this landscape could tell. The limestone, cherts and flints found in these hills were laid down by shallow seas which covered much of North America during the Permian Period. Winds and waters then sculpted this landscape. 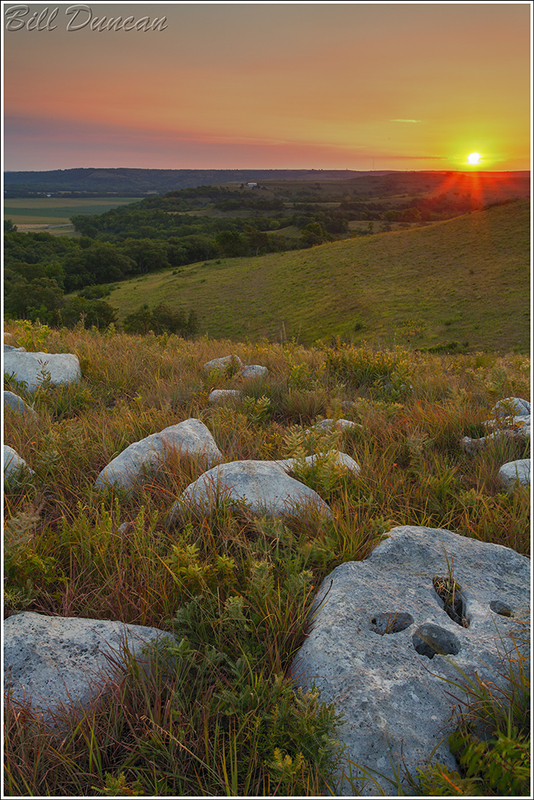 The Flint Hills were not much affected by glacial activity. Easy to erode shales and limestone were the primary building block of the shallow soils now found on these hills, while limestone and flint now remain. Much of this soil washed down the hills and collected in lower areas like in the Kansas River valley seen here below. The first grazers to feast on the prairie grasses and forbs of these hills were the Mastodon and Mammoth, followed later by the bison. Crops like maize and squash were first grown in this river valley by the Kansa Indians and now this fertile land is used to grow modern mono-cultures. This was my first visit to Konza, and I’m not sure why the tall grass of the tall-grass prairie was not very present in the spots that I found myself. This could be because of the drought, it could be because of livestock grazing system, or maybe I was in areas dominated by the “short-grass” species, found more typically in the western plains. These glade coneflowers, Echinacea simulata, were found in peak bloom during a May hike at Valley View Glades Natural Area. Pollen color separates this species from the near identical and more widespread pale coneflower, E. pallida, but some differences in growth habit can be seen as well. 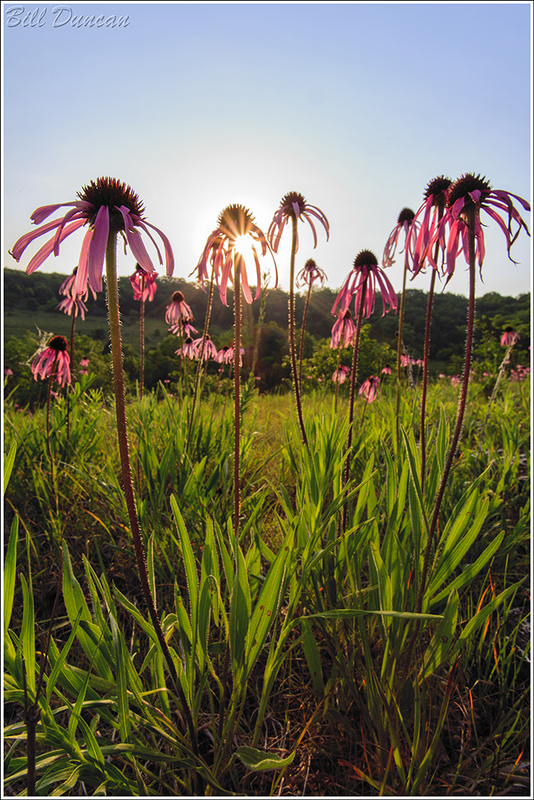 Some species of Echinacea are considered threatened or endangered and loss of habitat and the removal of these plants by non-licensed hunters for the pharmaceutical trade are the primary threats. There can often be found signs of plant harvesting and rock turning (looking for reptiles and arachnids for the pet trade) at this location and nearby Victoria Glad N.A. It’s a pity that more cannot be done to protect these ever-shrinking habitats. Last weekend Sarah and I took a trip west and found our way to the Little Apple – Manhattan, Kansas. Destination: The Konza Prairie of the Flint Hills, some of the only existing virgin tall-grass prairie left on earth. Less than 1% of the estimated 250 million acres of this ecosystem remain intact today, most of it lost to the plow before the year 1900. In this pano it is somewhat obvious why this area escaped agro-man. The fertile soils of the Flint Hills are shallow and contain a matrix of limestone and flint gravel. Homesteaders learned quickly that their sod-busting efforts were best spent elsewhere. In the valley you can see some gallery forest, supported by an early branch of King’s Creek, a tributary that feeds the Kansas River. Click on this image to view it full-size in Flickr. Starting my six mile hike about an hour before sunrise, this series was shot just as the first light of dawn was striking the hills. Located within Rockbridge State Park, just south of Columbia in Boone County, Missouri lies the Devil’s Icebox. This name generally refers to a collapsed section, or sinkhole of this cave system. One of the largest caves in Missouri, there is an estimated seven miles of caverns, tunnels and sinkhole surface connections. The geologic features found here were carved of the same Burlington limestone that formed The Pinnacles found a few miles to the north. 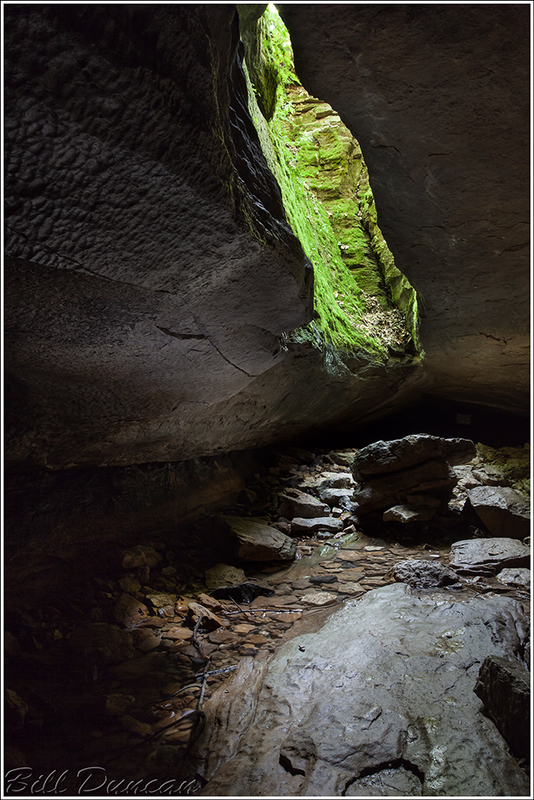 This is also one of the most biologically active and diverse cavern systems in Missouri, being home to two endangered species of bat and a very cool species of pink planaria (flat worm) that is found nowhere else on the planet! I’ve only had the pleasure of two brief visits to this location, but when water levels are low, like we have now, the underground streams and pools drop and allow for relatively easy access to exploring the caves. Apparently a good sized section is considered easy to explore and a couple of good headlamps are all that is required. A summertime visit is the perfect time of year to find out first hand why this place got its name. The temperature seemed to drop about 40 degrees F during our visit this past weekend. I can’t wait to get back here and explore some more! What Would YOU Call a 680 Ton Rock? 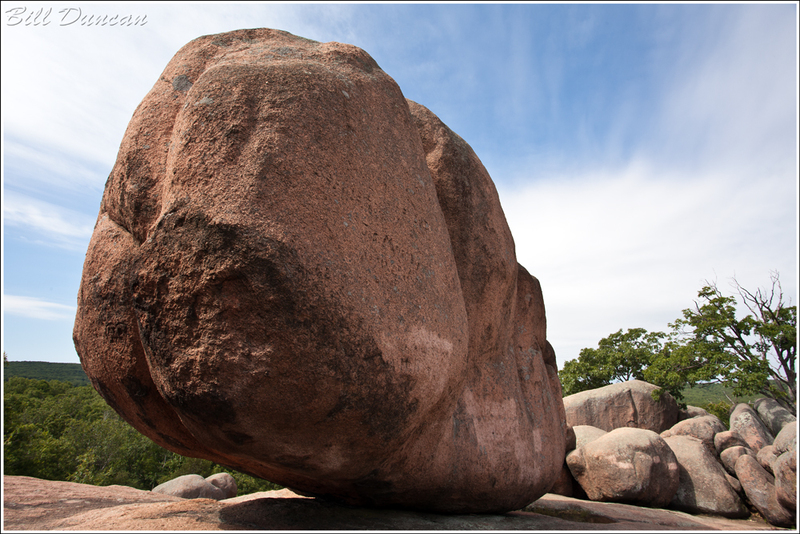 Meet Dumbo, probably the largest of the free standing boulders to be found at Elephant Rocks. I’ve shared images of this beast before. 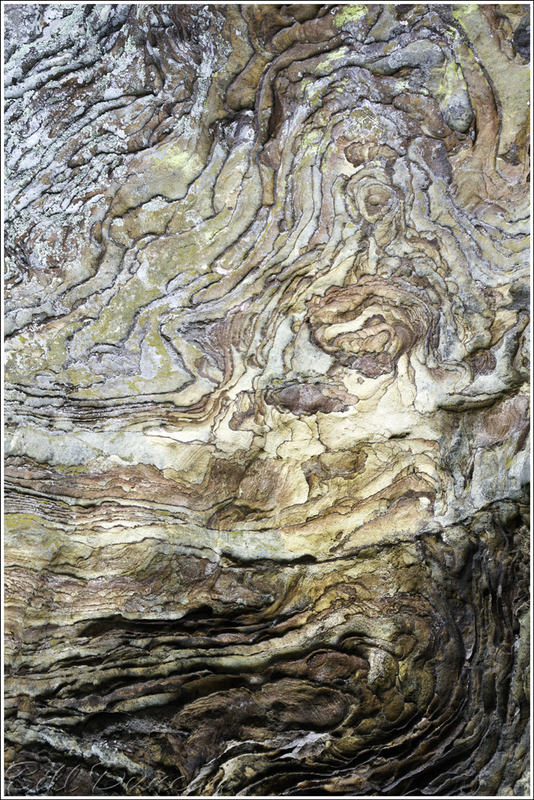 You can see more photographs of Dumbo and it’s granite pachyderm brethren on my Elephant Rocks State Park Set on Flickr. I’ve recently started really trying to take my post-processing to the next level. I have come to believe that I can control what happens to the exposure inside the magic light-capture box almost as well as I could possibly want. I’m not saying I know every trick in the book, but I do not feel that I am missing too much. Post-processing on the ol’ computer (equivalent of working on prints in the wet dark room of yesterday), I realize I can use some improvements and practice. So, recently I adopted some new software and set out to better improve my workflow and learn some new tricks on the other side of the negative. I am NOT saying I want to become a Photoshop/graphic artist, but just desire to be able to control aspects of the file that will allow me to create a final image that best represents my concept of the scene when I hit the shutter release. What am I getting at and just what does it have to do with this image? One of the possible adjustments that can be found in the latest versions of Adobe software products is the ability to correct for geometric lens distortion. This is a very cool correction device that allows issues of wide angle (barrel) and telephoto (pin cushion) distortions, usually seen in at least some respect in any zoom lens, to be easily corrected for in the computer. Depending on the subject, barrel distortion can be particularly troublesome. In this photo of Dumbo, I proudly went to ACR’s lens correction tab and hit the go button and looked at the results of the default setting. All of a sudden the cool, slightly exaggerated perspective of Dumbo was gone. The image became pretty boring, to be honest. This was a good lessen for me for a couple of reasons. 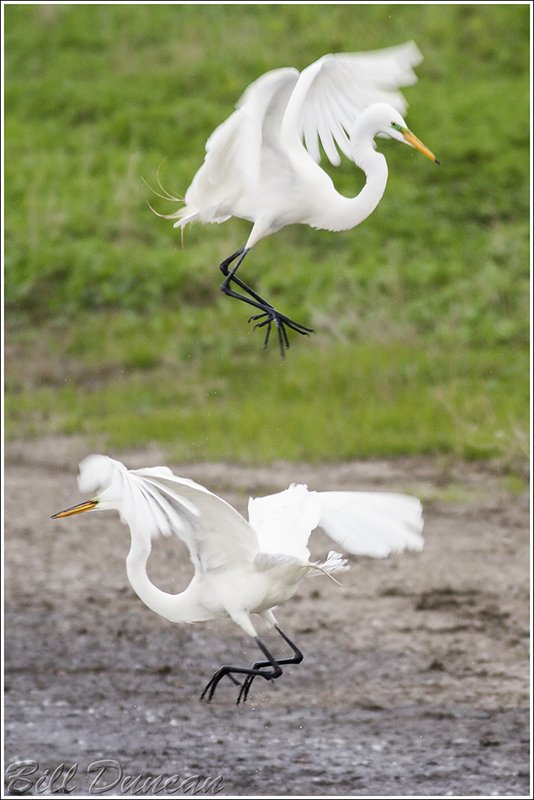 First, just as nature photographers might use changes in color-cast, manipulations of tonal range, or cropping unwanted portions of an image, we can also use (or remove) perspective changes from lens distortions to make our desired image. Second, any of these lens corrections made (vignetting, chromatic aberration, and especially geometric distortion) can and will cause degradation to the quality of the final image. We must carefully decide what corrections are necessary and use the sliders to make the minimum needed adjustments. Do not blindly accept the defaults given by the software. I have not been able to find much to read on this specific topic and I am still learning as I get more practice.